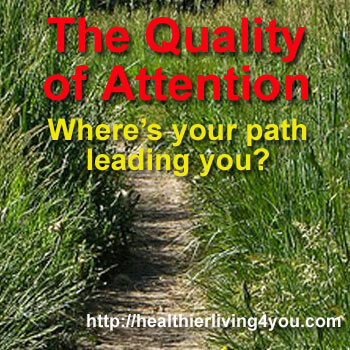 The Quality of Attention - Where's your path leading you? 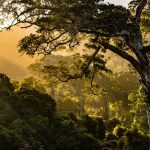 The Quality of Attention – Where's your path leading you? 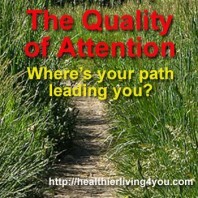 Home » Blog – Health Articles » Fitness & Exercise » The Quality of Attention – Where's your path leading you? Einstein wisely shared his definition of insanity as, “doing the same thing over and over again expecting different results.” With the New Year upon us we begin to dream, wish and plan for a new way of doing things. We want to navigate our lives differently – to have a fresh start. 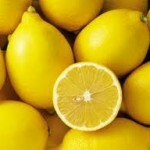 The article this week will provide you with a way to begin. So let’s try a new approach this year, shall we. Let’s start with this: make a short simple list of only a few things you would like to change in your life over the next year. Maybe it’s fitness, better eating, a new job, a new home, a fun vacation. Or this: get up earlier, drink more water and practice patience. Or it could be: learn to meditate, try Yoga, de-clutter the home or office. Make a short concise list of a few achievable items. We want to set you up for success; not a list of things far too long and unachievable. Let’s do some confidence building first. Now that you have a short list, let’s work on your attention. The quality of your attention is a key element to making long term change in your life. You want to ensure you focus on what you wish to see in your life, instead of what you don’t want. You create more of what you don’t want when your attention is focused in that direction. We can also inadvertently create that which we fear. It has been said: “What we resist persists.” Place your focus on achieving the items on your list, and try to stay away from all the things that could go wrong or past failures. We want to look at the big picture first, then the details of how we can follow. We also want to focus on the solution, not the problem. We focus on wellness, not on what is wrong. We can’t stare at the scale and hate our bodies – we won’t change it when we are rejecting it. 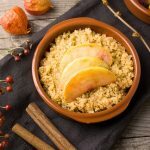 A cancerous tumour will grow with attention and will shrink when we take our fear-based energy away from it – and focus instead on being healthy overall. Make sense? We have also been taught that to succeed we need to struggle, work hard and pay our dues. We hear things don’t come easy, and we wait for the other shoe to drop. Do any of these phrases sound familiar? Is the working harder and longer working for you? (oh dear, echoes of Dr. Phil) Our success driven society has created high levels of stress, anxiety, depression, high blood pressure and the list goes on. This is why I suggested making a short list of items to tackle. We already have full plates to deal with. What is the quality of attention you are giving yourself? Have you heard the following phrase when being guided to making a change; ‘think positive,’ which I frankly find annoying. It is an overused statement, however – it does have some validity and deserves some explanation to refresh its meaning. I choose to feel good. My body produces everything it needs to remain in perfect balance now and always. I choose to let go of that thought. Some people like to imagine a big delete button or a big eraser in their minds they can hit when thoughts go awry. Control Alt Delete! I like imagining I am switching to another station to shift my thoughts back to positive ones. Like switching from a song I dislike to one I adore. Statements / ideas such as these can assist us in getting unstuck in repetitive thought patterns over time. Like a well worn path we have trodden many times, a rut is created. To change directions and make a new route we look at the quality of our attention and make a change to something better, and more in alignment with the direction we wish to follow. that takes us down a newly chosen road. We often have no idea of how often we actually say the same old thing, judge ourselves, judge others and replay old hurts, thereby re-injuring ourselves each time it is repeated / reflected upon. We need to tame the runaway mind. Here’s the thing…you cannot struggle to joy, fight for wellness or beat cancer…they are polar opposites and not on the same vibratory level. (It is also violent language to use.) You joy your way to joy, you focus on being healthy for wellness, and love and forgive your way out of dis-ease. Allow yourself to see, feel, hear, taste, touch and smell each item on the list you created in as much detail as you can muster. Make it real. Use the magic of your attention and the positivity of your thoughts to create an amazing 2014! I wish you an abundant winter season filled with much love, passion and adventure. As always – I am here to support you in this life journey and always love your feedback. See you soon!